Achieving all 17 of the UN Sustainable Development Goals (SDGs) is a mammoth task that will require a strong scientific basis. 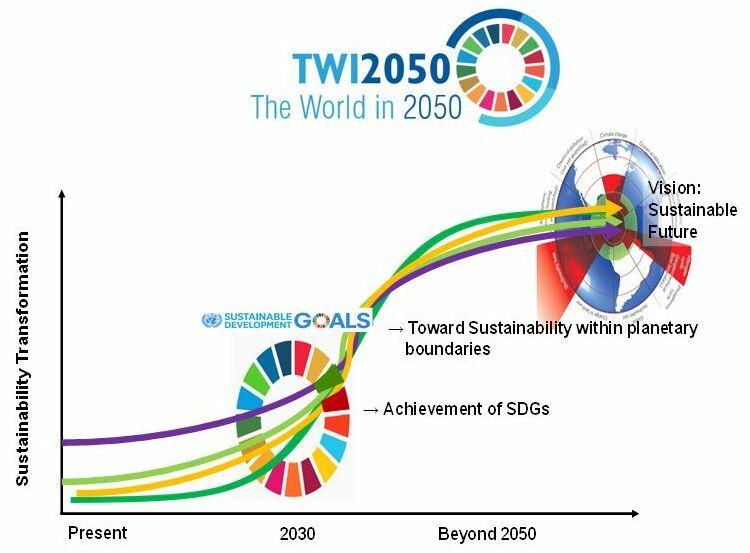 The World in 2050 (TWI2050) project is aiming to understand how to achieve inclusive economic and social development within planetary boundaries, the benefits of achieving this, as well as the costs of inaction. Using a systems approach, TWI2050 will provide science and policy advice for achieving the SDGs in an integrated manner so as to avoid potential conflicts among the 17 goals and reap the benefits of potential synergies. TWI2050, launched by IIASA, the Sustainable Development Solutions Network, the Stockholm Resilience Center, and the Earth Institute at Columbia University, brings together leading modeling and analytical teams from around the world, including major policy institutions. Under the leadership of IIASA Deputy Director Nebojsa Nakicenovic, researcher in the Transitions to New Technologies Program, the TWI2050 secretariat has been established, with several researchers and a program officer hired in 2016 to join the project. Technological innovation is of critical importance in achieving the SDGs, and sustainable development beyond 2030 requires a corresponding policy outreach at the highest international level. Recognizing the important contributions of IIASA to all of these factors, the UN Secretary-General appointed Nebojsa Nakicenovic to his special advisory 10-member group to support the Technology Facilitation Mechanism of the SDGs. The first TWI2050 working meeting, bringing together all major analytical teams, took place in March 2016 at IIASA. It is vital to understand the connections between the short-term (2030, the timeframe of the SDGs), medium-term (2050, the focus of TWI2050), and the long-term (2100 and beyond, the focus of climate research) dimensions of sustainable development. Alternative sustainable development pathways that reach all 17 SDGs and the transformation toward sustainability within planetary boundaries beyond 2050. Source: (WBGU 2011). A framing paper on these links was published in 2016 by Transition to New Technologies researchers, providing critical context for TWI2050 . Important synergies can also be found in the related work of the German Advisory Panel of Global Change (WBGU), on which Neboijsa Nakicenovic served as member from 2010-2016. Nakicenovic N, Rockström J, Gaffney O, & Zimm C (2016). Global Commons in the Anthropocene: World Development on a Stable and Resilient Planet. IIASA Working Paper. IIASA, Laxenburg, Austria: WP-16-019.